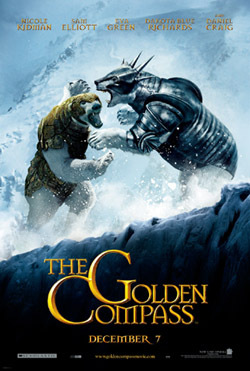 Golden Compass hits Lima! | personal.amy-wong.com - A Blog by Amy Wong. Oh, yeah! And Amy was there for the 4.20pm show~~ Amy needed her fix of Northern Lights. There weren’t many people then, and even though it was a subtitled version, there were a few kids… one of them was annoying! Talking all throughout the film… kinda cute (bordering on ‘I want to kill that kid’), but really bad-looking on the parent there who couldn’t shut him up. Northern Lights (aka Golden Compass) was suggested by a friend who knew I liked Harry Potter. After a while, I finally got the books at the beginning of the year. Couldn’t control myself, and had to read one after the other. Amy’s not a die-hard fan of HDM Trilogy, but it’s become her favorite series overall. Amy liked the series so much, she gave her friend the trilogy as a gift. She liked it too. Overall, the film was pretty good, except for the Flash pace. It is not as much as an editing fault because the film is not jumping, but many of the scenes don’t really flow… as, let say – Harry Potter and the Prisoner of Azkaban artistically flows… or how Harry Potter and the Order of the Phoenix is so choppy it makes you feel there’s a whole scene missing in between. Now, onto the good stuff. Effects are pretty good. Iorek is great, though I think Ragnar (aka in the book as Iofur) looked better. The bear fight had me gasping, even though there was no blood… if there had been blood, I would’ve been even more so. I loved Eva Green as Serafina Pekkala… and oh! the Witches are so cool!! They flew and fought with such elegance, it left me in awe. I also loved Nicole Kidman as Mrs. Coulter… evil or not, you have to love her. Dakota Blue Richards did pretty great as Lyra, there were times I thought it was not as good, but scenes like the one in Bolsvangar were very dramatic. I enjoyed the confrontation at Bolsvangar, even though it’s not quite epic… it was quite thrilling. The kids running, about to be attacked then Iorek shows up and BAM! SNAP! The Witches show up, arrows begin flying… golden sparkles, SWOOSH! And the Gypsies SNAP SNAP! 2 responses to Golden Compass hits Lima! Those this mean that I’m gonna get the books for xmas??? ?